Enjoy wonderful sunsets during your holiday in the town of Varigotti in Liguria, Italy. This town is the prettiest in the off season, when there is hardly a soul to be seen on the beach. Watching the sun go down and bathing the houses in a warm light is a sight that will stay with you forever. The church San Lorenzo, built in the middle ages, which stands alone and seemingly abandoned is definitely worth a visit. You can embark on wonderful tours directly from your holiday house in Varigotti. Apart from adventure trips with the mountain bike, the hinterland of Liguria is also suitable for hiking. In the evening you can enjoy the pampering in one of the restaurants directly by the sea promenade and taste the regional specialities. Varigotti is a small fishing village near Finale Ligure whose multi-coloured house facades has left many people mesmerized, most especially painters, and that can be experienced mainly during off-season, when there is hardly a person on the beach, and at sunset when houses are plunged into a really intensive and warm light. Varigotti was at that time still under the jurisdiction of the Genoan republic. After the French revolution it however became an independent municipality. Since 1869 it has ultimately been part of the municipality of Finale Ligure which belongs to the province of Savona. 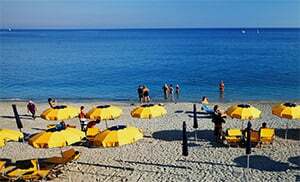 Varigotti is a village in the Savona province which lies in the Liguria region. There are several other villages near Varigotti, for example: Noli (4.6 km), Finale Ligure (5.3 km) and Verzi (7.2 km). When coming from Genoa take the highway exit to Sportono and then turn right onto the SS1. Follow the SS1 towards Ventimiglia until you reach Varigotti.